Elaine and her team at The Gorge Bear Co and World of Teddy Bears would like to extend an invitation for you to visit her and her many beary friends, over eighteen thousand in fact! Don't be surprised if your breath is taken away as you enter either of her shops. The Gorge Bear Co and World of Bears renowned for being the worlds best and biggest teddy bear shop most people will have ever visited. There is something suitable for everyone, from young to old, and something for everyone's budget. 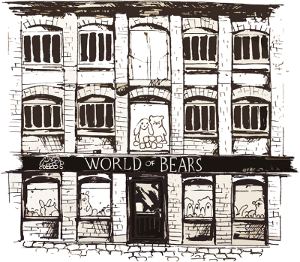 Both stores have areas dedicated to each major manufacturer, this combined with excellent knowledge makes her stores the leading specialist "teddy bear and friends" retailer in the UK. Most of the ranges are on display at our stores, that's all under one roof, giving you the biggest in stock choice in the UK. The range caters for all ages from new born to the discerning collector. For you to pick up, cuddle and love and for you to choose your favourite face. I offer a tedtastic range of over 18,000 cuddles in stock available in store and on-line. Hence we provide you the best possible choice under one roof at the best possible price. Now all these teddy bears and friends are personally selected by me and cuddled of course! Hence yes we do have most of our on-line brochure in stock. In the unlikely event it has sold out, you can be rest assured its already on order. We have partnered with, are key accounts of, and work closely with many suppliers to ensure we get priority delivery, i.e. Steiff, Merrythought, Hansa, Hermann, Charlie Bears, TY, Jellycat, Suki and Gund to name but a few. 20 Lower Middle Street, Taunton, Somerset, TA1 1SF. If coming on a special visit we always recommend phoning to confirm opening hours. Directions: Just five minutes from the motorway M5, J25, Follow Signs to Town Centre/Theatre, From motorway go over first roundabout, through next set of lights by castle, over next roundabout, bear left by mini-roundabout by Shell garage, following signs to theatre car park. We are approx. 2 minutes away from this car park. Stairs connect the split levels, please contact us in advance to arrange an appointment if you require a "personal shopper". Wheelchair access to lower floor only unless special arrangement is made which access to upper floors can be provided. The Gorge Bear Co, , Lakeside View The Cliffs, Cheddar, Somerset, BS27 3QE. Cheddar is famed for its gorge (upto 120 metres high in places), and cathedral like caves all formed around million year-old Ice Age river beds. Cheddar, according to local legend is also the birth place of Cheddar Cheese, records show that cheese has been made in Cheddar for over 800 years. Open Mon,Tue,Wed,Thu, Fri and Sat 11:00 - 4.00, Fri 11:00-4:00. 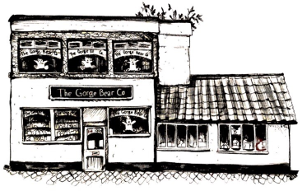 The Gorge Bear Co is our smallest shop some 1000 sq. ft, over two floors (but dont be fooled!, it is crammed full of over 4000 teddies, huge range of Steiff, Hansa, Jellycat, Suki, Keel, gund, TY, hermann teddy original..... and loads more ..
Open Seven days a week most of the year, Hours are Summer - 11 -4:30 (4.00 on sundays) Winter 11-4:00. Directions: Travelling from the North, M5 or London M4, take Cheddar exit No.22 on M5. Follow Cheddar Gorge and Caves brown signs for 8 miles. Travelling from the South, take Cheddar exit No.22 on M5. Follow Cheddar Gorge and caves brown signs for 8 miles.